Obviously, the best place for making art is on a swing and with a chicken at your side. This girl knows a thing or two. I'm having so much fun playing with this latest batch of yarn back from the mill. No matter the results, it's all an experiment and experiments - with no expectations - are just plain fun. The brown eyed Susan (Rudbeckia) turned out to be a bit underwhelming. I left the yarn in the dye pot for a full 48 hours, and even added modifiers, but the results were just a subtle shift from how they started (in the second photo above, you can see the undyed skeins on the left, and dyed on the right. Subtle! But there's always more dye to be added - perhaps these will be headed to an indigo vat. Or, I have visions of a striped shawl with all of these subtle tans and yellows. That would be lovely too. SO many possibilities. I'm keeping careful notes of all of this experimenting, perhaps not because I think any of it could actually be precisely replicated, but because it's already fun looking back at the notes and seeing what we used, and what the day was like. It's a bit more dye journal that precise dye notebook. The Queen Anne's Lace, on the other hand, gave me a solid shift in color and a lovely one at that (the undyed yarn is on the right in the last photograph above). It's a really soft yellow, but a true yellow, not like the yellows I get from tansy or golden rod. And again I think....hmn...stripey soft-colored shawl? Perhaps. It might have to be for Ani, who gathered most of these flowers for me ("Queen Annies" she calls them, and now I do too). Do you know how many flowers it takes to gather 400grams? A good deal! She worked hard for those flowers, my little one. Next up, I predict a little less subtly! Some madder root is currently soaking and in a few days, yarn will be added to that for what I hope to be a bit of color. It's so hard to wait! But so worth it for the joy of seeing what plant makes what color....and all the many little ways we can tweak that along the way. Magic! Or science! All the same. The first of our (many) sunflowers opened this weekend. It was actually a volunteer plant, this one. There were so many in the garden that I found this year, and where they weren't in the way or wouldn't make too much shade for plants beneath them, I just let them be. Which means that we have sunflowers coming up everywhere and anywhere right now. In the middle of a garden bed full of bush beans? Sure! At the edge of the cabbage bed? Yes! I'm not the only one who is thrilled with the abundance of flowers in the garden right now. Of course all the pollinators are too! I find our honeybees (and others!) all over the place right now, and judging from the frames that Steve keeps adding to the colony, I'd say they're quite happy indeed. Harper has taken a bit of a fondness to tending the bees with Steve....though I think a large part of that can be credited to the joy of playing with fire (via the smoker). Whatever the draw, I love watching them out there together working the bees. Ah, this peak of summer is so colorful! I am doing my very best to bottle it up for February. Literally, in the jars of preserves being added to the shelves each day, and the frames of honey being built. And figuratively, in my heart and in my mind, as I try to remember to slow it down this time of year. Savor, enjoy and delight in the height of this season. Wishing you a wonderful start to your own week, friends! Greetings from Brooklyn General Store! Brooklyn General Store resides tucked away on a sweet block West of the Carroll Gardens and Cobble Hill neighborhoods. At the north end of Red Hook, this commercial block on Union Street used to be a thriving shopping block for all types of foods and goods. Brooklyn General’s home within the Old Frank’s Department Store is a throw back to that era, with its preserved floor to ceiling shelves, rolling ladders and classic old wooden floors. The vintage interior is not reproduced, just uncovered, cleaned and painted. If the original shelving isn’t enough to hold all the goods, vintage rolling shoe racks, stacks of old blueberry boxes, vintage pie safes, vintage hardware displays and shelving built from reclaimed wood house the rest. Brooklyn General Store was created in an effort to provide the highest quality materials to a community of devoted artists and craftspeople and to promote making things by hand through inspiration and education. Not only is it a place to feast your eyes and hands on glorious colors and patterns and textures but it is a place that respects and honors a time when a trip to the country store was a way of life. It is a place where a visit for a yard of fabric turns in to a hour sharing and teaching with other people in our creative Brooklyn community. It is a haven where you can leave behind the city swirl and relish in a quiet place filled with inspiration and support for any project you can dream of. Following its mission to promote all things handmade, Brooklyn General offers a wide variety of classes in knitting, sewing, quilting, furniture upholstery, felting, spinning, rug hooking and embroidery. Classes are limited in size in order for students to have ample individual attention. Studio time with our fantastic new BERNINA classroom machines is also available. BrooklynGeneral.com was created to share our carefully picked goods with all the creative souls outside of Brooklyn, NY. Get a feel for the shop here. Get a feel for The Union Bag here. Please follow us on Instagram!! Catherine: As the owner of Brooklyn General Store, I am continuously on the hunt for textiles, yarns and beautiful and useful products and tools...preferably made by someone's hands. For 15 years I have been looking for my idea of the perfect project bag to no avail. For several years, I have been tossing around the idea of creating this dream bag...a bag that would be strong, utilitarian, hold several knitting or other projects and be sourced and made in the United States. This year, the dream has come to fruition and I have created a bag that I proudly call The Union Bag. The name stems from many things...the shop is located on Union Street, one of my favorite songs is "Union Maid" by Woody Guthrie and I love old photos of the Union Railroad with their bright blue Rail cars. The bags are made with Railroad Denim and lined in natural Linen/cotton with a smattering of pockets inside and one on the outside. The bag bottom, buckles, handles and straps are made with latigo leather. In addition, Brooklyn General Store would like to offer SouleMama readers 10% off all website orders for the duration of this weekend (July 23 and 24). Use code soulemama2016 at checkout! I love this giveaway! Thanks! Thanks for the chance. This Union Bag looks outstanding--I love everything that Brooklyn General stocks! Aren't all these gardens just beautiful? And the gardeners who keep them just so inspiring? I'm having such fun with this series. I hope you are too. Today, in Jaime's garden, we get to peek at one family's creative suburban backyard garden as well as their community school garden, which Jaime helped create. I think you'll love her heartfelt words about weeding, too - it certainly resonated with me and I can't count the number of times that my garden has been a therapeutic comfort in times of worry or stress - big or small. I think that's something so many of us share alongside our love for growing food. This is my eighth growing season as an at-home gardener. In addition to my personal garden, I also helped create and currently maintain a 40 x 110 foot school garden that is now entering its fourth growing season. I love growing food. It is my passion, my lifeblood. While I enjoy surrounding myself with beautiful flowers, I think fruit and veggies are where it’s at. There is nothing that gives me more pleasure than seeing the food I have grown, grace our plates at mealtime. But perhaps the most rewarding aspect of growing my own food, is sharing this passion with others. I have the absolute pleasure of working with the students of Cathedral of St. Peter School in their school garden. I began this gardening project four years ago because I feel many children have lost their connection to the food they eat. They view food as coming from the grocery store and have no idea how it is grown, or the work that goes in to growing it. Working with these students allows them to connect with their food, see how it is grown, and become an active participant in that growth process. Our garden project enables students to try new foods, and learn about the importance of consuming healthy foods and how that translates into fuel for our bodies and minds. Most importantly, our school garden work illustrates how to be stewards of Creation, and to value and cherish all that the Earth provides for us each and every day. My two daughters are the reason I started gardening. Prior to having children, my eating habits consisted of diet Coke and Poptarts. But when suddenly faced with the responsibility of caring for another human being, my thoughts on food underwent a seismic shift. I began devouring Michael Pollan’s texts, and was forever changed after reading Barbara Kingsolver’s Animal Vegetable Miracle. The tale of her family’s food journey inspired me take my own family on a real-food adventure. We work together, as a family, to grow the food we need, and supplement with food grown by those in our community. This year my girls built their own raised beds, chose what they wanted to grow in that space, and are on their way to their very own harvest this summer. I would describe my garden as a place of nourishment and strength, for both the body and the soul. My garden has always brought me a sense of peace, but that took on an entirely new meaning last summer. On June 30th, I lost my mom to an extremely aggressive form of cancer, and during this most difficult time of my life I found myself in my garden. I found there is nothing more therapeutic than crouching down amongst all that green, plunging my hands deep into the soil, and pulling out weeds from the root. It almost feels as if this simple act helps me to get to the root of my problems, and as each weed falls in my bucket, a small piece of that grief and frustration falls into the bucket as well. And so, whenever I am feeling like I need a bit of a pick-me-up I set off for my garden and pull out my struggles, piece by piece. And in the end, I am left feeling a little bit lighter, and find myself surrounded by a beautiful miracle. One that will provide my family with beauty and sustenance for many months ahead. And one that I know my mom is looking down upon with a smile on her face. I would say my greatest gardening accomplishment has been the ability to provide food for my family. My garden allows me the opportunity to place healthy food in front of my family that not only fills their stomachs, but also truly nourishes them. I believe that the work and love I pour into our garden can be tasted in the food we consume, and helps us in our quest to live healthy lives. I am proud of the fact that in the hot summer heat of late August, when I spend hours on end in the kitchen chopping, canning, blanching and freezing, I will have a freezer and larder full of our homegrown food to get us through the winter. And I absolutely love sharing my overflowing passion for food with our family and friends. My name is Jaime Zanocco Fagan and I am a wife, mother, suburban homesteader, and educator. My family and I live in the Midwest where we aim to live in harmony with Creation. My family’s adventures are chronicled at makingofahome.com. Thank you, Jaime, for sharing your garden! Annabel, from the back, chimed in with her knowledge of the ride-home plan. "Ice cream!" she said. And that was true - I had promised an ice cream stop at a new place along the route. It was yummy (but what ice cream isn't?). "We need to stop for Japanese knotweed!" Harper shouted. "And I need more Queen Anne's Lace!" I added. There was an audible moan from the passenger seat (too tired to exercise his new driver's permit in my seat). Because there's nothing my fifteen-year-old loves more than stopping on the side of the road so Mom can pick weeds. But he's a good sport, and ice cream can get you through most any kind of parental torture, and so we carried on. I carry clippers in the car now, because there are too many times I wish I'd had them with me and didn't. (I usually keep a pair of tall boots in the back of the car too, because poison ivy and I are not friends, and walking through tall weeds is kind of just asking for trouble. Or so I hear.) I'm pretty mindful of where we stop and 'pick,' much to the chagrin of my kids who would like for me to stop at the very first spot they find, even if that's in front of our neighborhood post office. Since I'm generally looking for invasive plants anyway (not sure that either of those two things are very 'welcome' by most growers around here), I feel just fine on overgrown state roads, and only taking a little bit. That's all we needed on this trip, anyway....a few more Queen Anne's Lace to add to a dye pot I have nearly ready to go, and some japanese knotweed (bamboo) for a project Harper had in mind. The day before he had mentioned 'seeing somewhere, in a book or something' directions on making a flute from the knotweed (which he knows from working with it on other projects at Koviashuvik Local Living School). Steve puzzled over it with him, unable to suss out the source, and then it dawned on me, "Um, do you mean TAPROOT??". Of course that was it. Issue 17::MYTH featured a pan flute tutorial by Michelle Housel. The tutorial came in and the issue came out at a time when all of our bamboo was dried out and split too easily...but now! Now we could make it, and I had an eager little guy leading the way, knife on his beltloop, twine in his pocket (always). These flutes, I must say, were incredibly fun to put together. Just the right amount of work that could be done by the kids and help they needed from me. Not too tricky so as to frustrate them and have them lose interest. And lots of fun stops along the process to check out our work - like testing out each section to see which pieces sounded best (much to the delight of Greta). They were finished just before dark, and we wandered down to the garden to show Pop, who was taking a go at those bugs. Today, we'll do a little bit of reading about Pan, which I think might just inspire some more play with these. Annabel woke up with hers beside her, insisting that she will continue to practice (poor little thing can't get a sound out of them yet, despite everyone around her being able to do so. She's determined to do so and I'm sure she'll get it today. Even if she passes out first from blowing so often and so hard!). And then, onto the Queen Anne's Lace! Phew! So many good things to be done in a day! The garden is literally exploding right now. The wide and open dill flowers, the cabbage that curls into itself more each day, the sungolds turning, well, gold, and the peppers that appear from out of nowhere. The morning glories are almost reaching across the arch we made in the sunflower circle, where the sunflowers tower over Annabel's head (but not yet Harper's). We can see the ears of corn on the stalks forming, and a new flower blooms each day. It feels like fireworks in the garden each time I look, though far grander and simpler than any of those I've seen in the sky this month. Last night, on my way to check on the potato bugs (I think they're winning this year for the first time, I just can't keep up with them), Annabel came running from playing with the goats and told me she needed a snack of peas. She sat down on the edge of the raised bed and began to pick. Just before dinner at the end of a long day full of adventure and sun, I could see she was exhausted and that sitting still for a moment might just be what she needed (before she crumbled). I diverted from the potatoes (see? the bugs win) and asked if she'd help me pick a basketful of peas instead. "Can I sit right here?" she asked, confirming the exhaustion. A few minutes later we found ourselves both all the way inside that raised bed pulling the last of the peas and readying a pile of stalks for the chickens to pick at. We talked of all things, side by side, and we worked in silence too. Of course, she ate more peas than she put in the basket, but that's okay. That's how these things roll. She impressed me with her knowledge of how the plant grew, what we'd do with the garden waste (it would go to the chickens or pigs, then to the compost to become soil that would then go back to the garden), and asked what we'd plant next in that spot now that the peas were done. My heart swelled, a little bit, in pride at this little five-year-old who has grown up no other way than harvesting peas in the garden, barefoot, with her Mama. And it was just about then that she declared (once again - this is a frequent Ani statement): "You know, I really don't like salads." And I said once again (as this is our schtick), "You can't not like salads, Ani. That's not a food, that's just how we describe a mix of foods." She gave me a scowl far too old for a five-year-old (older siblings, I tell you, that'll age a baby! ), and said, "Mom....you know what I mean. All the green thingys you put in salads. Like the lettuce." "And the spinach?" I asked. "But what about the almost white buttery sweet lettuce, you like that one right?" So my little girl doesn't like salads....or anything 'green' for that matter (excepting peas). And as I was laughing to myself about that last night, I got to thinking about my kids in the garden over the years and that very typical moment that Ani and I shared. They've all had different levels of interest in the garden and that's changed from year to year. Maybe one of them will decide to manage one particular crop for the season...and more or less follow through with that. Or maybe they'll want a space of their own. Or maybe they're great at hauling barrels full of compost or mulch from here to there (in hopes of then asking for a ride somewhere). Or maybe they'll just stop by for a chat and find themselves weeding beside me without really knowing it. Different involvement, different kids, different ages. But I suppose the thing that stays the same is just that it's a constant in their life. That they can be sure to find me here, and that they always know they're welcome. And I for one, can count some of our simple moments together in the garden as some of my most treasured. It's been unseasonably warm here in Maine this month, and even more so - unseasonably dry. Gardening is tricky in this weather, since we're not usually set up for needing to water this late into the season. But we're making it work, slowly and by hand (or by rain barrel or with a hose that travels a very long way from the house and therefore trickles by the time it hits the plants). The heat has us jumping in the lake (or ocean) as much as is physically possible in a day, but not really lingering by the shore. Too warm, it is declared (I know...listen to the Mainer's struggle with low 90s weather). Our house, thanks to the smart ones who built it two-hundred years ago, faces in just the right direction and stays cool all day long downstairs. It's comfortable, and precisely where we all find ourselves retreating to on such hot days. This weekend found us all in more than out as a result. Games, music, art....and canning, of course. Because when it's so warm, why NOT turn the oven on and get just a little bit warmer? (More of a case is being made by the day for a summer kitchen! Someday, perhaps!). I had a few marathon sessions of canning and freezing this weekend, and the shelves of preserves are filling up quickly as a result. This is without a doubt our best raspberry year yet (year four of the plants), which is delightful. Some thinning of the carrots made for a big batch of carrot pesto for the freezer. I harvested some of our fennel for a relish. And the beets just keep coming in, begging to be stored for January. While I'm still water bath canning for some things and pressure canning for others, I added a steam canner to the mix this year. I was hesitant to add another 'gadget' to the kitchen, both for the storage challenge and the unnecessary complication factor, but I'm won over. The process is just so much easier, uses less water and takes less time (heating up that big pot in the hot water bath canner always takes a while). I'm only using it with high-acid foods and thus far, have only used the recipes that came with the canner itself. Steam canners, if you didn't know, are a bit controversial. I've been following the guidelines by the Utah State University Extension for doing so. The weekend built up like that - a lot of time in the kitchen working on this or that that was being preserved, breaks for running and jumping in the lake, a game of dominoes here and there....and waiting, waiting, waiting for the break in the air that only the rain can bring. It came, finally, just after dinner on Sunday night. Heavy, cool, comforting rains that sent us all out to be poured on, and as quickly as it came, the sun returned. This time, a bit easier to handle, thanks to the rain. Greetings from Lucy Mason Whole Person Life Coaching! In my coaching practice I work with women who are often in the midst of the uncertainty and ambiguity of a transition. They are trying to regain balance and sustained well-being, while also maintaining loving connections in their relationships. They come to explore their yearning to connect with their true meaning and purpose, bringing all of who they are into how they live their lives. Through coaching they cultivate the courage needed to untangle the knots of unhelpful behaviors, beliefs or expectations and open themselves to their value and importance on the planet. They learn to honor the wisdom that comes from within by embracing their own truth; this leads to greater insight in navigating life’s challenges. I believe we are all in the process of “becoming”. We are all searching to see ourselves and to be seen in the world in all of our wholeness. Whole Person Life Coaching acknowledges and embraces the fullness of that experience and gently facilitates the journey to greater clarity and inner peace. Visit my website and Facebook page for additional information. Lucy: I’ve always loved hearing people tell their stories, their troubles, their fears, their wildest imaginings, and dreams, while listening for the wisdom we each hold inside but sometimes overlook. When I came to a time in my own life when I was feeling disconnected and in need of grounding, I hired a life coach. I wanted to see if the profession was something with which I felt a kinship. I also needed to realign the life I was leading with my true self. Working with a life coach helped me find my balance and reconnect with my values.These values form the foundation of my ability to fully and honestly participate in life. The guidance I received through life coaching unlocked my inner wisdom and solidified the truth I knew deep down, that coaching was my own calling and passion. A Discovery Session - Two to four hours of guided self-discovery. Assess your life as a whole, get clear on the values that guide you, create a vision of where you would like to be and take your first steps on your journey. In addition, Lucy Mason Whole Person Life Coaching would like to offer SouleMama readers a 10% discount on Discovery Sessions through the end of September 2016. Mention the SouleMama blog to receive the discount. Midlife brought multiple challenges my way. I would be so thankful to have help envisioning my opportunities. Thank you for the chance, Lucy and Amanda! Reading about Holly's garden I got a chuckle out of the image of them moving into their urban neighborhood....and instantly tearing up a beautiful lawn! "Wherever we can," she says, "we grow food." I love the creativity that comes out of gardening in smaller spaces, and Holly certainly shows us just how much can be done. I'm sure you'll enjoy this tour today of her beautiful space, thriving with natural life all within the city of Minneapolis. Garden Size: Our urban garden consists of a main 30x40 veggie patch, multiple other beds around the house where we squeeze herbs and more veggies in, fruit trees in the lawn, and berry bushes that line the border of our property. I’ve had my own garden for 6 years. Prior to that, I assisted in a student-­run garden for a couple years during university. Gardening gives me peace, keeps me grounded and makes me feel alive. 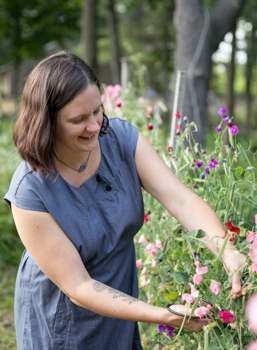 Originally, I came to grow my own food through learning about our conventional food system during my time in the rural sociology department at UW­Madison. I wanted to support something else, something of life, beauty and health for humans, animals and the earth. The more food that I grew, the more I realized I loved the lifestyle of farming, the time outdoors, the exhilaration of the work, and the rich, rich rewards. Our garden is located in the heart of NE Minneapolis, MN, just a couple miles from downtown! We found a house with a double lot and have been making the most of our outdoor space. To the surprise of neighbors and the former owner, we dug up most of the grass as soon as we moved in. We hand-­dug the beds two shovels deep, removing massive amounts of rock, and adding tons of compost over the years. We are situated on a fairly busy street, so passers­by often stop to remark at the garden and pick raspberries; we hear lots of people talking to the chickens, too! I love showing people that lawns can look different. Often times, neighborhood kids that stop by have never seen a tomato growing, or held a chicken before! It is really fun. The garden itself, to be honest, has been quite functional. Wherever we can, we grow food. If we need a shrub, it’s fruit­-bearing. If we have space for a tree, it’s fruit bearing. The whole fence line is berries. While I do find growing food to be incredibly beautiful, just this year I have made an effort to learn more about native perennials and incorporate more flowers. We have been learning a lot, trying to grow as much food in a small space as we can, and still have room to give the chicken flock spots to “pasture,” leaving a little space in the yard for two beehives, two dogs and two kids with lots of playmates! I mostly just drool over catalogues ­ Bakers Creek Heirloom Seeds and One Green World Nursery are my favorites. I keep thinking I have more space than I do! Keeping my chickens from undoing all my garden efforts! Our chicken coop is a combined greenhouse used for transplants in the early spring months. We’re constantly experimenting with how to give the chickens the most space, while protecting our seedlings in the greenhouse and in the yard! I make it a priority to move the chickens around to give them greens to eat and get their poop in the garden, but they always find a way out and go straight for my brassicas or tomatoes! On days when I feel overwhelmed by weeds and my to­ do list, I try to remind myself that my lifestyle IS the accomplishment ­ that I am doing all this while having young kids around all day; that despite being up multiple times in the night with the baby, having the day made shorter by long, drawn-­out bedtimes, tripping over kid messes and coping with non­-nappers, I somehow manage to start it all from seed, can salsa, and learn about honeybees. It is never perfect, there is always something I didn’t get to, but we are doing it! So hard to choose! I always have a solid patch of kale somewhere out there, I love growing lots of beautiful lettuce for fresh summer meals, and despite the lack of space, I give a large chunk of it to winter squash because it stores easily and we rely on it to get us through the long winter! I also love to buy at least one new seed packet every year and just give it a try! The new thing this year is celeriac. I invite children into gardening activities whenever I do them. There is little else as beautiful to me as seeing those pudgy fingers pinch tiny seeds to start, or seeing raspberry=­stained smiles. Even something like learning to recognize common weeds and removing them can be fun for kids! They aren’t always on board when I get down and dirty, but as my daughter gets older, I see the influence it has on her. I am so proud when she begs to harvest asparagus, goes out to pick peas on her own, or gets giddy for a sweet pepper snack! It is also valuable to our family to involve children in processing what we harvest, from cooking dinner, to preserving food, and baking. Above is a picture of my daughter after successfully making a rhubarb custard pie from scratch, dough and all, with her own hands! Mulch, mulch, mulch! I try to mulch any exposed soil to help keep weeds back, keep the moisture in the ground and help build soil long­-term. Being in the city, I can easily collect all my neighbors’ leaf bags in the fall. I store a huge mountain of them behind the house and use them for mulch in the spring! I am currently home full time since our youngest was born this winter, and will homeschool our 5yo this year. I also blog about gardening, bees, chickens, processing our garden bounty and more at http://www.buddinghomestead.com. Another big labor of love in our house is developing Tended ­ - it’s web­based garden software to help gardeners and small farms design and track the many details of their operation. It is free, and we are so excited to share it with the world! Thank you, Holly, for sharing your garden! The most wonderful of packages arrived on my doorstep last week. Really, I don't know what could bring more excitement than the delivery of our own yarn, all packed up - washed and spun, in neat and tidy skeins of yarn. This time around, save for one small black fleece that came back as roving, I had it all spun into yarn rather than mostly roving as I've done in the past (because a girl can only spin so much, which isn't very much at all really). We sent this spring's shearing to Battenkill Fibers, and I'm thrilled with the result. I gave it all a good wash and fluff once it was in the door, and waited not-so-patiently for it to dry so I could put it right to use. First, as I guage-swatched (this batch is all worsted weight), and then cast on for a new sweater (Mountain High by Heidi Kirrmaier). It's knitting up so beautifully, but I might be biased of course...given that I love the sheep and all the shepherds who care for them. And do you see all that lovely white, natural color in there? Just asking for some natural dye? Well, I haven't wasted anytime in that regard either. Looking in the back yard for what is available right now, I'm going to give some Rudbeckia a go. I gathered it and started soaking it last night, and the yarn is in a mordant bath of rust, hoping that might bring be closer to an olive or green color. I have no idea, really, it's all an experiment and just so much fun. This particular experiment might take a while, as I'm going to give everything a good long soak, but I'll be sure to update you when it's done. And now...back to that knitting. Or maybe I'll just hold that basket of yarn one more time. A dream come true, I tell you. It really is. Lest anyone tire of the salad that is on the table at lunch and dinner each day right now, I've been mixing it up with a whole lot of salad dressing options. Cilantro Lime was a favorite and so was Roasted Garlic and Buttermilk. Yum. And though those pictured above may not be the prettiest, they sure are tasty. Should I forget to make popsicles, the kids are reminding me each and every day. Because a frozen yogurt with blueberry popsicle for breakfast is FAR tastier than a bowl of yogurt and blueberries. Of course. We have the book People's Pops that we've made a few things from, but mostly we just wing it with what we have. Simple syrups or yogurt. The canning has begun! My beets are so big and plentiful in the garden (red ace, always a winner), so in addition to eating them often, I've begun the season of canning. Pickled beets to last all the year long. Hooray! And that's just what I heard shouted from the garden now..."Hooray!" as it seems the raspberries are fully ripe and ready. It looks like breakfast is going to be a walk at the berry bar. Kings and Queens indeed. And you? What's happening in your kitchen these days? Greetings from Root & Star! Root & Star magazine brings beautiful art, stories, poems, and activities to young children. We love to inspire (and be inspired by) the WHOLE child—the wise, the wild, the strange, and the sweet. Children see you get your magazines in the mail (hi, Taproot! ), and they love to receive quality gifts in the mail, too. As a family, you can get cozy this summer as you enjoy Root & Star magazine together—which is peaceful and silly and thoughtful and gorgeous. As you flip through the pages, you and your child can feel more grounded, peaceful, and uplifted by the beauty and wildness of true art and quality children’s literature delivered to your door six times a year. Visit the shop for subscriptions and single issues, Facebook and Twitter. Christine and I are both writers and artists who then became mothers. She is situated in Seattle, while I am in Virginia, which can make for an adventurous collaboration. For a project we did for our newest issue, Christine mailed smelly seaweed across the country so that I could print it on paper. We recently met for a blissful weekend in the middle of the country to align our visions, get newly inspired, and map out the next year’s issues. We love learning about other artists, writers, and innovative parents who can contribute to the magazine with us. By creating this collaborative labor of love, we hope to inspire families to see the beauty in their children, and to inspire children to be their whole selves—to feel all of their wisdom and their wildness. We believe that children of all ages can enjoy quality literature, and that children’s literature should be beautiful and thoughtful enough that the whole family can get something out of it. We launched our first four issues this year, and we are so pleased with their quality. Because we are ad-free, we are indebted to our tiny readers and their generous caregivers, who help us to continue to bring beauty and literature to young families. This is beautiful! Thanks for the chance. what a great giveaway. I think both my boys would love this. Thanks for the chance! I can't remember when or how I first stumbled upon one of Corina's videos (Corina is now a SouleMama Sponsor as well), but besides the knowledge that she shared what emanated most of all from her voice was joy! And reading her answers to the garden questions below, I think I might have an idea where some of that joy comes from, and I get it, I really do. The soil! It's contagious, too, that gardening joy. Read on below to see for yourself. Of course I feel proud that I provide nutritious, fresh, organic food for my family many months of the year, but equally important is the fact that gardening is my therapy! Did you know that there are microbes in the soil that act like natural antidepressants? That explains why I love digging in soil with my bare hands. It makes me happy. It's hugely productive. I grow tons of veggies in raised beds, so I plant them closer together, which yields more food. Since I raise goats, chickens and ducks, we have beautiful materials for making compost, and our soil fertility is awesome. I like my garden to be tidy, which might be the German in me. My house is always such a messy disaster since my three homeschooled children are always home, that my garden feels like the only place I have control over. I garden for functionality and beauty! What are your favorite gardening books? All books by Elliot Coleman are great, as well as "How to grow more vegetables" by John Jeavons. We live in a rainy climate, so slugs are happy here. They can decimate a bed of freshly transplanted veggie starts in one night. I've sat in the garden and cried because of these slimy creatures. But since we've gotten our ducks, slugs are not as prolific anymore. Also: deer. They come in at night and eat my green beans. Throwing bird netting over the beans keeps them away from the beans. Feeding my family healthy food, while building soil fertility over time instead of depleting it. I think it's important to eat food grown in fertile soil, since you can buy organic food in the store, but it's not necessarily high quality if it's grown in poor soil. Tomatoes!!! Homegrown tomatoes are sublime! A local band puts it best in their signature song: "Homegrown tomatoes, homegrown tomatoes, everybody loves their homegrown tomatoes... only two things that money can't buy, and that is true love and homegrown tomatoes." A huge role! We homeschool them, and they play an important part in our homestead. (My six year old daughter is a joy and big help assisting with goat births). Plant in raised beds when you can. The soil warms up faster in spring, drains better, and helps roots grow nice and deep. Don't till the soil if you can help it - it destroys soil structure and microbial life. I do my whole garden with a broadfork (I have a video on youtube on how and why to use a broadfork). Amend the soil with compost and cover the soil in winter with a green manure crop. It does wonders for it, like a nice, cozy blanket that builds fertility and soil structure. Is there anything else you’d like to tell us about your garden? I love flowers, and although I grow lots of perennials and Old English roses in different flower beds around our homestead, I do incorporate annual flowers in my veggie garden, because they are pretty and attract pollinators​​. Plus, they reseed themselves every year (calendula, borage, poppies). Corina Sahlin homesteads on five acres at the edge of the wilderness near the Cascade Mountains, where she grows a lot of organic food. Together with her husband Steve, she raises goats, pigs, ducks, chickens, an adorable puppy, and a gaggle of three children, whom they homeschool. Corina was born and raised in Germany, is an artisan cheesemaker, writer, transformative life coach, obsessive-compulsive knitter, and teacher of homesteading skills. She teaches and inspires people to live simpler, more wholesome and sustainable lives in her online courses, as well as on her homestead. Together with her husband, she teaches wilderness and homesteading skills to children and adults. You can find Corina and her work on her website, instagram and you tube among other places! Thank you, Corina, for sharing your garden! With everyone else occupied during the day on their own adventures, I've found my days this week full of the fun and play of (just!) a five year old and a seven year old. It's reminiscent for me of earlier parenting days when the boys were little and it was just the three of us adventuring in the daytime hours while Papa working. This week, just like in those days, there have been lots of trips to the beach and impromptu visits with friends and all those flexible things that are just a little bit more doable with a smaller crew, and the interests of a much smaller age range to please. I may not be getting a lot of work done, but we sure are having a lot of fun. And if sitting at the beach for hours, wading in the water, exploring in the tide pools and ending it all with ice cream weren't enough to bring all that nostalgia my way, I have to add a little bit of wool. Because nothing says summer beach like a little bit of knitting with wool. No? Well, call me crazy, but it's the best. I've made a few rounds of handwarmers (Camp Out Fingerless Mitts) this week - something small and easy to toss in a bag, something that doesn't require a pattern, but still is fun to knit (mostly thanks to the changing colors of the Noro I'm using for yarn). And while they may not be suitable for wearing on a beach day (Oh, Ani...silly ham), I'm certain that around the corner is a season in which they'll be most appreciated. Though it may seem a bit off-season of a craft, for some reason I've been pretty excited about soapmaking this summer. One more than a few occasions this month, I've found myself up well past the kids, at in the kitchen on making the latest batch (being that night time is when the kitchen is free - in theory - of kids, pets and food, and therefore safe(r) for using the lye). Maybe it's the open windows that are a lot easier to bear in summertime (again, for the lye) or maybe I'm thinking ahead towards the holidays. Of course, I'm totally fooling myself by saying that, because there is no doubt that I will start giving this stuff out just as soon as it has all cured, as I'm terrible at keeping gifts for surprises. So I'm sure I'll be happily making more in October. Though I am a true beginning soap maker and nothing fancy has come of my efforts yet, I'm finding that like sewing, or knitting, or any other crafty adventure, it's becoming more enjoyable the more time I spend doing it. Partly, that's familiarity with the process, but it's also the result of having not only a nice stash of supplies (mostly purchased from Mountain Rose Herbs and Brambleberry), ingredients and tools on hand, and a designated place to store them. All of that means that if I'm suddenly inspired by a recipe I want to try, it's very possible I have all of the ingredients and can just get rolling while the inspiration is hot. I'm not really ready for making my own recipes (perhaps I fear the math, and the waste that would come from a mistake), but thankfully there are plenty of wonderful recipes out that that I've been eager to try. I picked up a new book - Pure Soapmaking by Anne-Marie Faiola this spring and everything I've made lately has been from that. The green and rose are Comfrey & Spirulina, the round ones are Buttermilk Honey, and the small cubes are a simple Castile-Brine. Next up is Nettle & Yarrow, I think. This week, though, the garden is truly starting to come into the kitchen and I think my nights might be spent in there preserving food more than anything. But then again, there is the new cross stitch kit that arrived and those sewing patterns too. And I just got word that my latest batch of fiber is due back from the mill any day now. Oh! If only I could find a way to add a few more hours to each day for all of these good things! And you? What are you making these days? This morning, the faint smell of barbeque food still lingers alongside the smoke from the fire pit. And as Annabel woke from her bed, and came into ours to snuggle beside me (many hours past when that usually happens, sleepyheads), I noticed that despite the necessary bath before bed last night, her hair was still stuck together in one spot with marshmallow, then covered in dirt on top of that. Yup. 'Tis the season! Oh, summer weekends! What a lovely and long one we just had too. With just-right weather, and all the ingredients for a classic summer weekend - gatherings with friends, guitars around the firepit, a lot of baseball, sprinklers, s'mores, popsicles, swimming, and awesome food. So much food. I'll take it all quite happily. And hopefully, weekends like that will happen many more times before this season passes by. Our neighbors had a fireworks show on the lake that we watched. I worry about a few things when that happens (because...it's fire!...and though I can be a bit of a worrier, I think I'm justified when it comes to fire), but Greta always tops the list of my worry with all that startling unexpected noise. She was fine this year, not stressed at all. At least not about the fireworks. However, Sparkle, our new scarecrow (named by Ani - could you tell? ), sure is giving Greta some grief. Being that it's her job to protect all the animals at night, she has not been okay with this stranger in the pasture. We made Sparkle this weekend, in an attempt to ward off the crows that are stealing all of duck and chicken eggs - so boldly that they harass the nesting birds to get off the eggs! Not okay! We think we've got Greta straightened out now, and hopefully her early belief that it was real is a good indication that the crows will do the same. We'll see. I know most of the world started your week yesterday, but for those of us still lingering in long weekends, I wish you a gentle re-entry today! And I will remind you that there's another summer weekend just four days away! Alewives Fabrics is owned by the mother/daughter team of Barbara Neeson and Rhea Butler. We've been in business since 1975 and our family has owned the shop since 2004. We sell to local customers through our brick and mortar store in Midcoast Maine but we sell fabrics all over the country and the world through our web store, www.alewivesfabrics.com. We specialize in contemporary textiles: quilting cotton from the latest designers, Liberty of London Tana lawn and Linford Fleece, flannel, voile, vinyl laminate, linen/cotton blends and much more! We also carry a huge range of English Paper Piecing supplies and a flagship store for Quince&Co. yarns. Alewives Fabrics is active on Instagram, Twitter and on Facebook! Alewives hasn't changed too much since the last time we were featured on SouleMama. We have a fun line-up of summer classes and workshops (including a "Slow Sewing" cruise on the schooner J&E Riggin in September!) and for our online customers, we have a new club called "Lucy Boston Sundays" where every Sunday afternoon we debut a new kit to make a Lucy Boston quilt block. Most of all, though, we continue to stock the best of today's quilting cottons and other contemporary textiles. We sure do love our fabrics! One of our custom made Liberty of London Tana Lawn charm packs. Each pack contains 42 different 5" charms of Liberty Tana Lawn. Perfect for all kinds of patchwork and crafting endeavors! In addition, Alewives Fabrics would like to offer SouleMama's readers FREE SHIPPING on their online orders through Saturday, July 9th. For international customers we'll take $10 off shipping charges. To receive the discount, please enter SOULEMAMA into the promotional code field when you check out. We'll take care of the rest! In-store customers who mention the SOULEMAMA promotion at the register will receive one free fat quarter ($3 value) from our pre-cut selection of fat quarters. Alewives looks like a beautiful place to visit! One of the things I'm loving most about these garden tours is seeing how, despite how very different our gardens may look and grow, many of our reasons for having one are the same. The peace it brings, a connection to our food. I'm being especially inspired by those gardening in smaller spaces than I, who exercise so much creativity and thoughtfulness in the way they use their space. That's what you'll find today, in Kate's garden, along with some fun and whimsy too. I garden because it is the one and only thing that brings 100% peace to my life. There are lots of positive influences in my day to day existence, but my garden is my church, my therapist's couch, and my place of happiness all rolled into one. It is the one place that makes me feel centered and alive. To have that in my own backyard is nothing short of a blessing. I also garden because I want to give back to the land. I focus on building healthy soil in order to give back to the earth that feeds us. I focus on building trust with the wildlife: feeding the birds who provide pest control, the bees, hummingbirds and butterflies who provide pollination, and the earthworms who keep the soil aerated and alive. I focus on symbiotic relationships between myself and the creatures around me, instead of forcing them to yield to my demands. That said, I have yet to figure out the role of the squirrels and chipmunks here, but that's what netting and screen is for, I guess. It changes from year to year. I spend my entire winter reading and researching gardening styles and techniques, and then plotting out my own little area over and over again until I'm content with it. One year I'll opt for square foot gardening, another will feature nothing but straight lines and harsh angles, the next is wild and crazy like a cottage garden. There's no rhyme or reason, just whatever I'm feeling. There's always a whimsical touch in there though. Lots of gnomes, crystals, cairns. Those things are a constant every year. I have beds tucked in all around my property, and those I mostly allow to just be what they want to be. Large swaths of Lily of the Valley, big bulging patches of Black Eyed Susans, long rows of lilacs, and peonies wherever I can cram them in. What's your biggest gardening accomplishment? We own just shy of an acre of land, and our house takes up most of that. The garden started out small and grew a little more every year. I think my biggest and proudest accomplishment is that we are finally able to grow enough fruits and vegetables to last us the entire year, without visiting the supermarket. The freezer and pantry go a little dry around March (really? squash again??? ), and I'm constantly trying to remedy that. I like to utilize every spare inch of space in my garden, so once the largest crops start taking off, I'll jam some lettuces, onions, leeks or radishes in the empty spaces. It helps to keep the larder full. Can you share one of your favorite gardening tips? Absolutely! My favorite tip always comes in handy in early spring when weather is fickle. I go to the local dollar store and buy clear drinking glasses in various sizes and use them as cloches to protect delicate plants that might not be sturdy enough to survive a frost/heavy wind/snow, etc. Dollar stores sell drinking glasses for a song, and chances are good I'm going to break one or two every year, so I keep myself well stocked. Sure, I have a few vintage and antique cloches, and I do use those. But the drinking glasses are easily replaceable, and I'm not heartbroken when the inevitable squirrel comes along and knocks down a whole row like dominoes. It works! I am a full time housewife and crafter who lives with the absolute best husband a person could ask for. We have two (soon to be three!) dogs who keep us on our toes. In my spare time I love sewing, crochet, metal work, and various other crafts. I sell my wares online in my shop and in local brick and mortar shops. I also have a Tumblr blog where I post regularly about the goings on in the garden and in my life. Thank you, Kate, for sharing your garden!